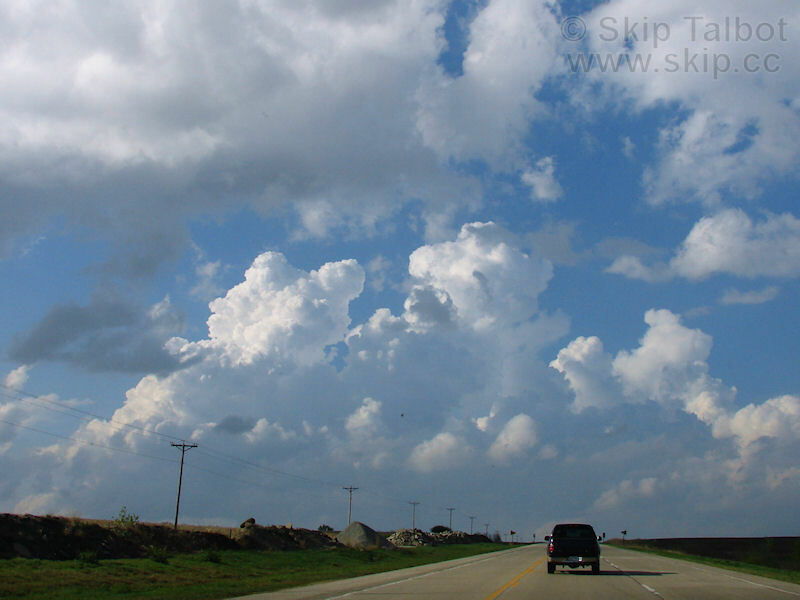 Dryline/Coldfront play in southeast Nebraska. Targeted Auburn, NE area for northeast moving storms under moderate instability. Met up with Danny Neal and Adam Lucio and followed afternoon towers up I-29 in Iowa up to I-80 before abandoning dieing convection for new development closer to original target. Intercepted picturesque supercell near Eagle, NE noting rain free base and a rain shaft that looked like a landspout. Called it a chase after dark with a great lightning show and met up with Danny Neal, Adam Lucio, Chad Cowan, and Jenna Blum for dinner at Applebee's in Council Bluffs, IA. 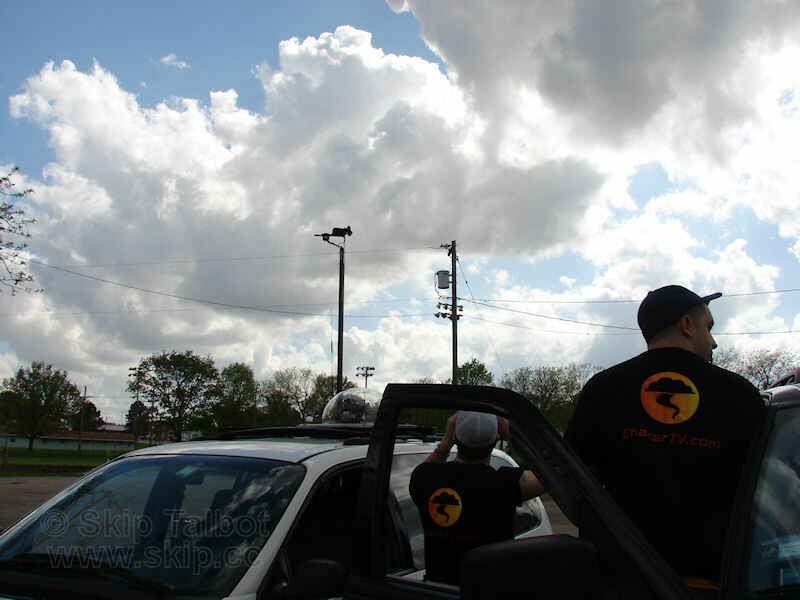 Friday was the final day in a three day Plains marathon chase run. 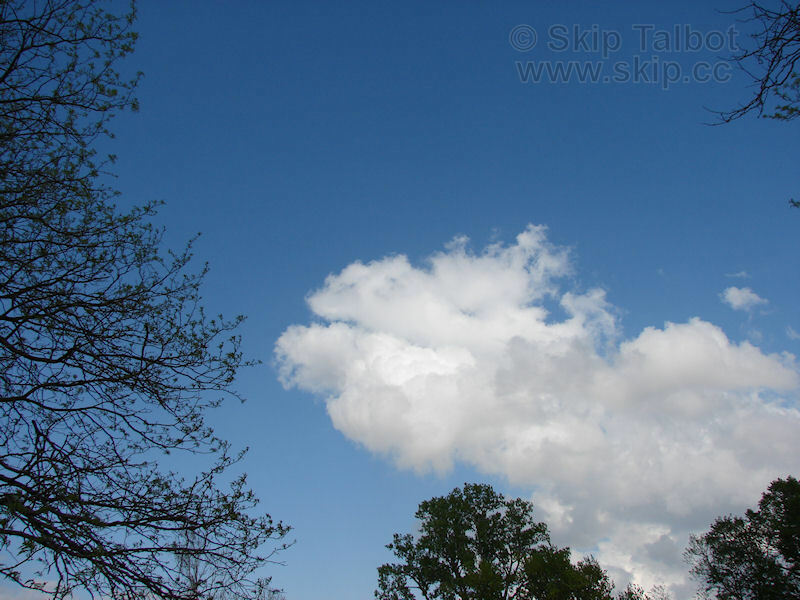 The best shear and instability combination looked like it would be over northeast Texas into Arkansas. These areas have some of the world's worst chase terrain, however. There was a secondary target up in southeast Nebraska that looked promising as well with moderate instability and good directional shear. I had spent the night before sleeping in the van outside the small town of Orlando, Oklahoma. I was awoken in the middle of the night to strong, probably severe winds rocking the van. I fired up the laptop to get a peek at the radar and a reading from the roof mounted anemometer. The radar showed the southern end of a severe warned squall line going overhead, but I didn't have all the needed software setup to get a wind reading. At least it wasn't a tornadic storm. For the third night in a row, I got a crappy night of sleep. I was rolling again by about 7 am. I made for my target of southeastern Nebraska, heading for Nebraska City. Passing through the I-470 tollbooth in Topeka I got a tip from the operator who noticed my chasing equipment. "Discovery Channel just went through here with all them goofy lookin' vehicles," he said. Curious as to whose group it was, Reed Timmer's or Sean Casey's, I asked him, "What color was the tank, red or black?" He though for a moment, "...red." Ah ha, Timmer! The dryline looked to be holding in northeastern KS, so I decided to hang around Auburn, NE which was just short of Nebraska City. For the third day in a row I got an Italian BMT on Italian Herb and Cheese with all the veggies. I got gas at the Shell on the north end of town and waited there checking data. An elderly lady had been eyeing my van for awhile and finally she came up and asked me. "Are you radar or weather?" What!? I think she thought I was a speed trap until I told her I was a storm chaser. Adam Lucio and Danny Neal met up with me there after awhile. Towers started to go up just to our north and we decided to pursue, hoping they might mature as they approached the better directional shear along the warm front which was up by I-80. The cell was moving mostly north, and with the Missouri River and Omaha in the way, we decided to pursue on I-29. After getting stuck in a single lane construction zone, where miles and miles of perfectly good road had been closed with no work being done on it, we finally caught the storm near I-80. 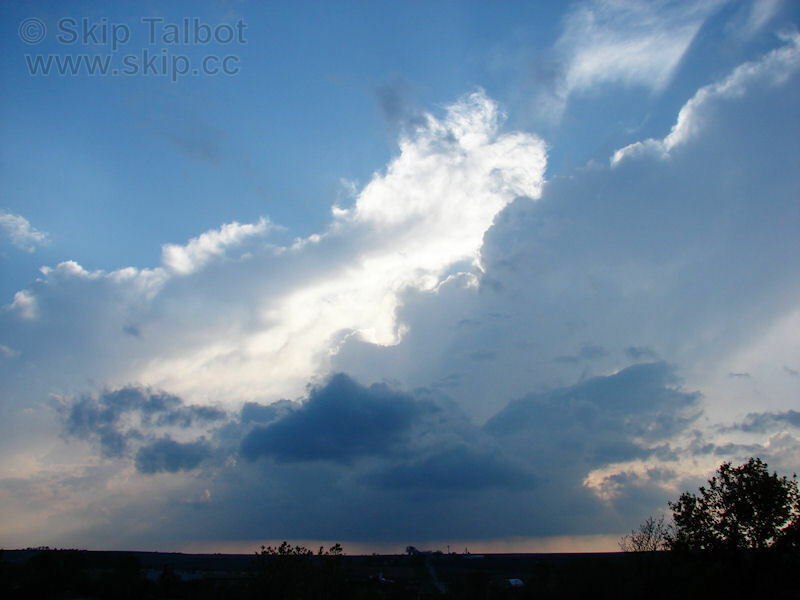 Probably due to a lack of instability, the storm was more an unimpressive shower. I took a few pictures of it catching some sun rays and then we noticed, just west of where we had been sitting all day, storms were firing and rapidly intensifying. We raced back down south and split up near Omaha. 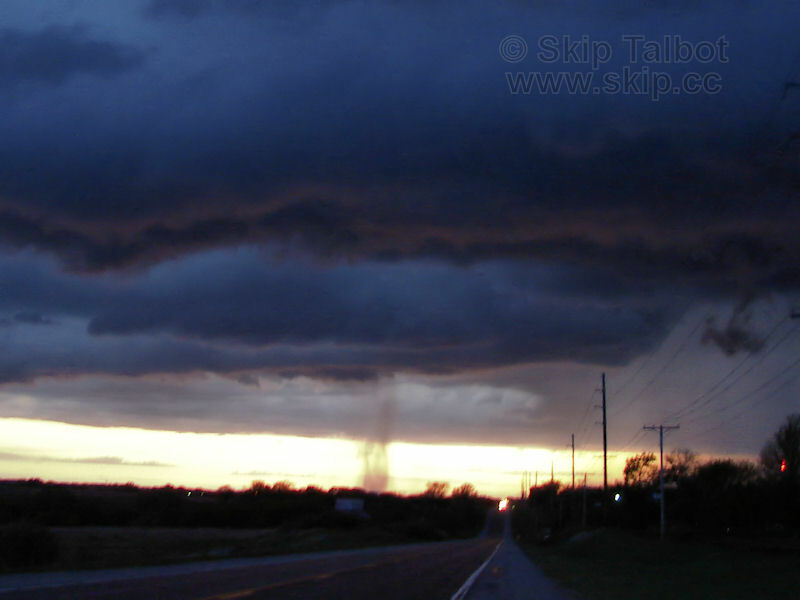 One of the rain shafts under the base became more well defined as it approached the highway. The sheath of rain looked like a tube of dust and the plume at the bottom like a debris cloud. For a awhile there even appeared to be a point funnel above it. As I watched, it looked more and more like a landspout. I even started checking Spotter Network to see if others were reporting it as such. If I had stumbled upon this sight I probably would have hit the button and reported it. I had watched it from the beginning though so I knew it was just a rain shaft. This was probably one of the most convincing tornado look-a-likes I've seen, however. I pursued the storm into the darkness and there was a nice lightning show. The storms looked like they were starting to dissipate, however, so I met back up with Adam, Danny, Chad Cowan, and Jenna Blum for dinner at the Applebee's in Council Bluffs, IA. I ordered steak as a belated celebration for the tornadofest in Texas the day before. We had a good time sharing stories about the day before and Adam and Danny scoffing at the rain shower I thought was a landspout. Your browser does not support inline frames or is currently configured not to display inline frames. This chase was a borderline bust, given the expected tornado potential. 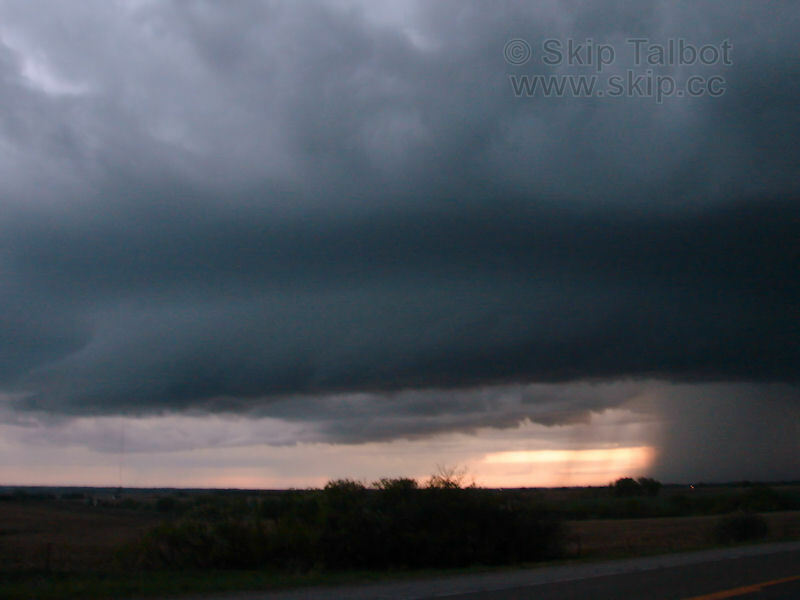 I did see a picturesque sunset supercell, however, so it was an enjoyable chase for me. I hadn't missed any tornadoes in the area as well so I made the best of the storms that I had to work with. The only tornado reports were in NE TX where they were expected given the stronger shear profiles, and a few under a surprise supercell near St. Louis. As I ended the chase, my wind vane mounting bracket snapped and I had to take the mast down that has my wind instruments mounted on it. It took one of the cups off the anemometer in the process. I have yet to get a severe wind reading with those instruments and have replaced them several times already, so I will probably discontinue trying to measure wind speeds on the chase as it seems to be more trouble than its worth. Rain shafts can be very deceiving. Wind instruments are more trouble than they are worth.